This novel approach, dispatches digital ants to wander through computer networks. They look for selp-replicating malicious programs that try to break into computers. Each ant acts as a herald, once it finds a threat it calls the army to converge at its location hence drawing attention from human operators. 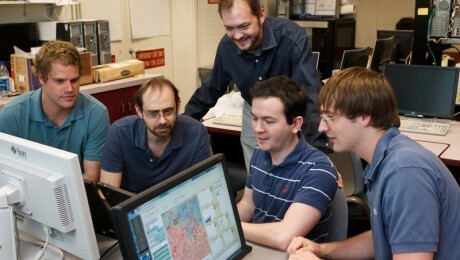 The digital ants team: professors Errin Fulp (standing) and Kenneth Berenhaut (second from left) and students Ross Hilton, Jacob White and Michael Crouse. The idea is to deploy thousands of different types of digital ants, each looking for evidence of a threat. As they move about the network, they leave digital trails modeled after the scent trails ants in nature use to guide other ants. Each time a digital ant identifies some evidence, it is programmed to leave behind a stronger scent. Stronger scent trails attract more ants, producing the swarm that marks a potential computer infection. In nature, we know that ants defend against threats very successfully. They can ramp up their defense rapidly, and then resume routine behavior quickly after an intruder has been stopped. We're trying to achieve that same framework in a computer system.